It is well known that solar power and wind power are the most sought-after renewable energy sources. However, they have not been extensively connected to the U.S. grid due to intermittency issues. That is, they mandate the use of energy-storage systems that, at the least, run nearly $100 per kilowatt hour and can be operated in only specific locations. MIT researchers have developed an “air-breathing” battery that could store electricity for very long durations for about a third the price of current technologies, with minimal location restraints and zero emissions. CREDIT: Courtesy of the researchers. Left photo: Felice Frankel. At present, Scientists from the MIT have come up with an “air-breathing” battery with the ability to store electricity for longer periods of time for nearly one-fifth the expenditure of prevalent techniques, and also with zero emissions and very little location constraints. Using the battery, intermittent renewable power can now be made a highly dependable electricity source for the grid. The anode of the rechargeable flow battery is made of inexpensive, easily obtainable sulfur dissolved in water. The cathode of the battery is an aerated liquid salt solution that continuously absorbs and liberates oxygen that carries out charge balances when ions go back and forth between the electrodes. When oxygen flows into the cathode, it makes the anode to liberate electrons to an external circuit. The oxygen that flows out delivers back electrons to the anode, thereby recharging the battery. “This battery literally inhales and exhales air, but it doesn’t exhale carbon dioxide, like humans — it exhales oxygen,” stated Yet-Ming Chiang, co-author of a paper depicting the battery and the Kyocera Professor of Materials Science and Engineering at MIT. The study has been published in the journal Joule on October 11th, 2017. The combined chemical cost of the battery, which includes the cost of the anode, the cathode and the electrolyte materials, is nearly one-thirtieth of the cost of other opponent batteries (e.g. lithium-ion batteries). Scaled-up systems can be used to store electricity from solar or wind power, for many days to the whole seasons, at just $20-$30 per kilowatt hour. First Author Zheng Li, a Postdoc at MIT at the time the study was performed and now a Professor at Virginia Tech; Fikile R. Brushett, the Raymond A. and Helen E. St. Laurent Career Development Professor of Chemical Engineering; Research Scientist Liang Su; Graduate Students Menghsuan Pan and Kai Xiang; and Undergraduate Students Andres Badel, Joseph M. Valle, and Stephanie L. Eiler were the Co-authors of the paper along with Chiang. Designing of the battery began in 2012 when Chiang joined the Department of Energy’s Joint Center, as part of the Energy Storage Research project—a 5-year project in which 180 Researchers worked together on energy-saving technologies. As part of his contributions, Chiang was keen on designing an effective battery with the ability to decrease the money spent on grid-scale energy storage. According to Chiang, one of the main problems of batteries in the past has been producing materials with the ability to provide higher energy density. However, such materials have been quite costly. For example, the materials prevalently used in lithium-ion batteries, for cellphones, cost nearly $100 for every kilowatt hour of energy being stored. Initially, the team determined that sulfur—an abundant byproduct of petroleum and natural gas refining that has high energy density—will be the anode, as it has the lowest cost per kilowatt hour of stored charge, following air and water. Then, the challenge was to zero in on a less costly liquid cathode material with the ability to be stable while also generating a significant charge. This appeared to be unlikely before an accidental finding was made in the lab. Potassium permanganate was one of a restricted list of compounds, which when used as a cathode material is “reduced,” that is, a reaction in which ions from the anode travel to the cathode, thereby discharging electricity. Yet, the challenge was that reduction of potassium permanganate is in general an irreversible reaction, that is, the battery cannot be recharged. Despite this, Li worked on it, and as anticipated, the reversal could not be achieved. Yet, actually, the battery was being recharged owing to an unanticipated oxygen reaction that took place in the cathode, which was functioning totally on air. I said, ‘Wait, you figured out a rechargeable chemistry using sulfur that does not require a cathode compound?’ That was the ah-ha moment. 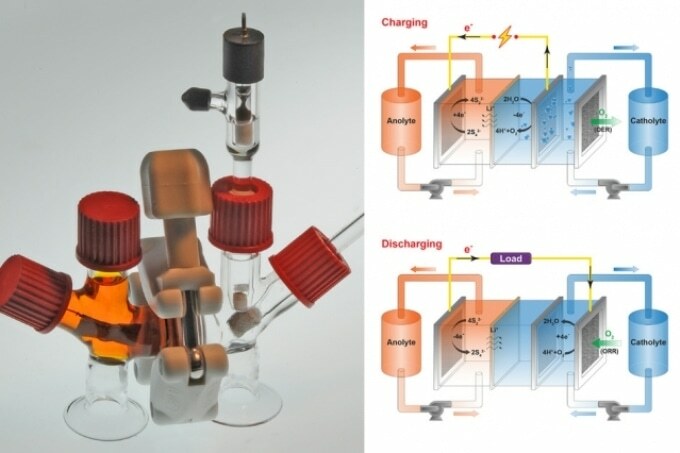 The Researchers used this idea to develop a type of flow battery in which electrolytes that are steadily pumped by electrodes move through a reaction cell to generate charge or discharge. The battery comprises of a liquid polysulfide anode, or anolyte, including sodium or lithium ions, and a liquid cathode, or catholyte, including an oxygenated dissolved salt, isolated through a membrane. During the discharge phase, the anolyte liberates electrons into an external circuit and the sodium or lithium ions move toward the cathode. Simultaneously, to preserve electroneutrality, the catholyte absorbs oxygen, thereby producing negatively charged hydroxide ions. During the charging phase, this process is just reversed. The catholyte liberates oxygen, which leads to increase in hydrogen ions that liberate electrons back to the anolyte through the external circuit. “What this does is create a charge balance by taking oxygen in and out of the system,” stated Chiang. As the battery is developed using materials that are considerably less expensive, its chemical cost stand one among the lowest, although not the lowest, of any rechargeable battery to ensure cost-efficient long-time discharge. The energy density of this is a little bit lower than the prevalent lithium-ion batteries. It’s a creative and interesting new concept that could potentially be an ultra-low-cost solution for grid storage. At present, the size of the prototype is nearly equal to that of a coffee cup. According to Chiang, however, the size of the flow batteries can be largely increased, and cells can be integrated into larger systems. Due to the ability of the battery to discharge for many months, it may be best used for storage of electricity generated from specifically erratic solar and wind power sources. The intermittency for solar is daily, but for wind it’s longer-scale intermittency and not so predictable. When it’s not so predictable you need more reserve — the capability to discharge a battery over a longer period of time — because you don’t know when the wind is going to come back next. He further added that seasonal storage is also indispensable, specifically when moving north of the equator where the availability of sunlight largely differs between summer and winter. According to Chiang, this might be the first technique to challenge pumped hydroelectric storage systems in terms of energy density and cost. Although the pumped hydroelectric storage systems are widely used globally for energy storage in the case of renewable energy sources, they are limited by location. “The energy density of a flow battery like this is more than 500 times higher than pumped hydroelectric storage. It’s also so much more compact, so that you can imagine putting it anywhere you have renewable generation,” stated Chiang. The Department of Energy supported the study.